The south of Spain is filled with spectacular hideouts that you can visit if you fancy naturism. Therefore, we bring you this list of the best nudist beaches in Andalucia, to feel comfortable even when on holidays. Spread in the five coastal provinces of Andalucia, the best nudist beaches offer secluded corners to sunbathe and swim in your birthday suit. The list we present below is divided into the five provinces of Andalucia that boasts direct access either to the Mediterranean Sea or the Atlantic Ocean. This way, you will easily find your favourite naturist beach. Located near the town of Estepona, this 850mt-long beach welcomes the first nudist touristic complex that was created 40 years ago. The complex relies on all the facilities, and you’ll be surprised by its beach and the surrounding area. Among the services of the beach, you can find showers, bins and rental hammocks with parasols. This naturist oasis lies on the western side of the town of Benalmadena, and if you want to get away from the hustle and bustle of the city, this is the place to be. This small cove is surrounded by cactuses, bamboos, palm trees, aloes, and all sort of Mediterranean trees, that unite to shelter this 100mt-long beach from strangers’ eyes. And that’s because you must go naked here (you have to be at least 18 y.o. to access the beach). You can eat at the nearby chiringuito only if you show up completely naked. Last but not least, remember that this beach gets crowded on summer weekends. This is Malaga city’s only authorised nudist beach. Located near the Guadalhorce mouth, this beach welcomes nudists and clothed, although on the right of the shore there’s an area dedicated exclusively to the first group. Here, you can do some birdwatching, as its relaxed ambience converts this beach into an ideal destination for families. 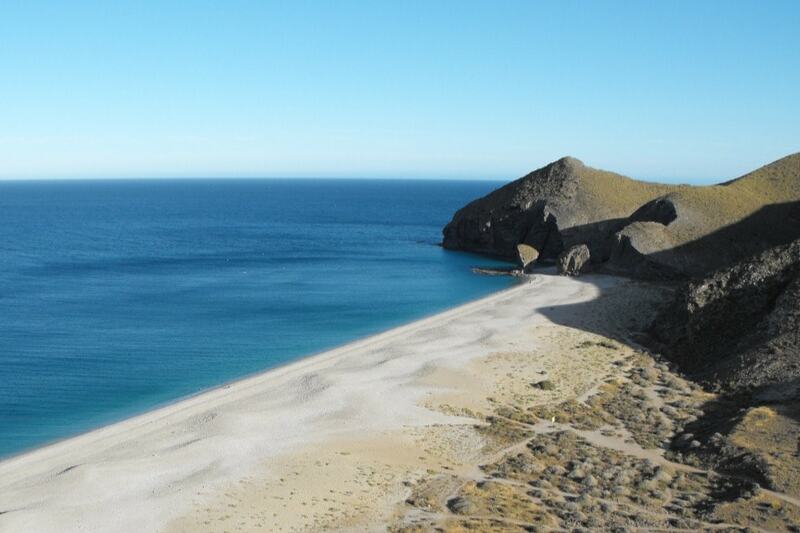 This virgin and secluded beach belongs to the town of Almayate, and it’s completely nudist. Even in its chiringuito, renowned for the excellent value for money of its specialities, you can eat without any clothes on. Besides, right behind the dark-sand beach, there is the naturist camping Almanat, where you can rest in bungalows and mobile-homes as you enjoy practising naturism. Although Granada’s seashore is not the biggest in Andalucia, it offers numerous possibilities to enjoy naturism in splendid settings. 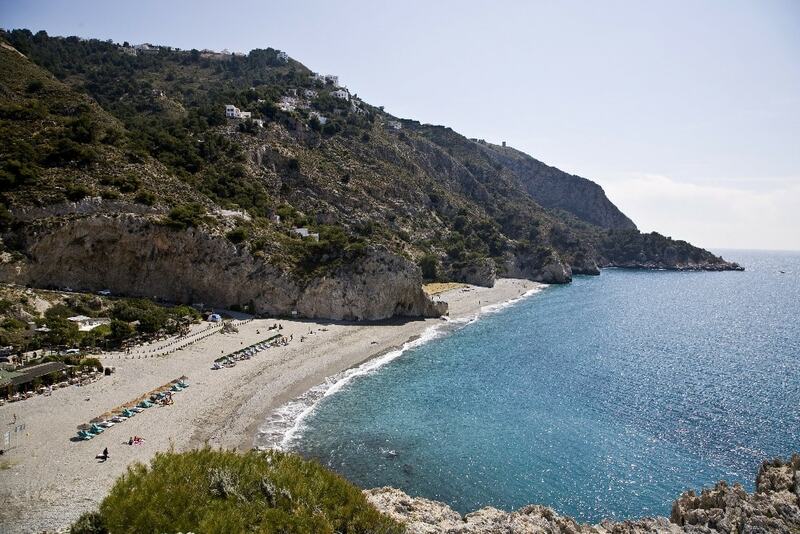 This small beach lies near the Cliffs of Maro-Cerro Gordo, in the Granadine town of Almuñécar. The cliffs are so imposing that they define the uniqueness of this beach, which, moreover, relies on exceptionally clear waters. It’s considered to be one of the best and wildest naturist beaches in whole Andalucia, where you can either go with or without your clothes on. Another plus of this beach is the possibility to do snorkelling, as the area rejoices in the ban on fishing. 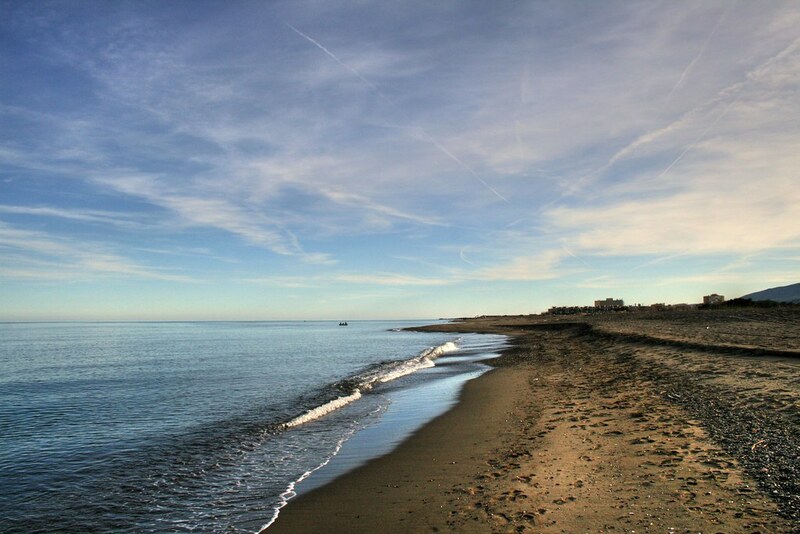 This 400mt-long secluded beach is located in the town of Almuñécar, between Punta San José and the Peñón del Lobo. It stands out for its rocks, sand and gravels that characterise the nudist shores, presided by the impressive cliff known as Pico de Águila (the Eagle’s Peak). This offers splendid views of the surrounding landscape, where nudists and no-nudists share the shore especially in summer and on weekends. 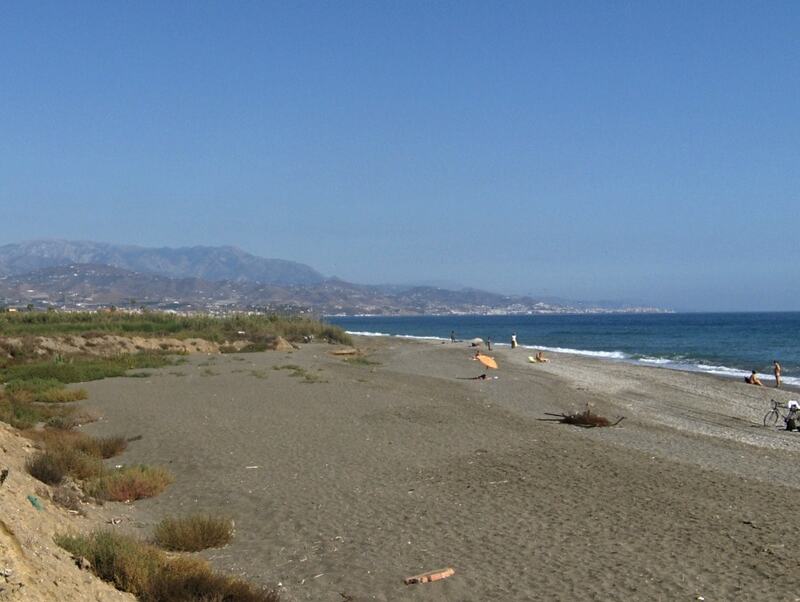 Known as one of the best beaches where to practice naturism in the province of Granada, this beach relies on the cared-for sand and clear waters where you can take a dip. This is a nearly-virgin beach, meaning it lacks all services. But if you want to reconnect with nature, it’s the ideal destination to go. Just remember that, if you go in summer, you’ll have to get there before the afternoon, as it gets crowded in a very short time. On the contrary, if you’re in Granada outside summer, you’ll have this little shore almost entirely for yourself. The Reservoir Negratin is one of the unique options to enjoy naturism in Andalucia. 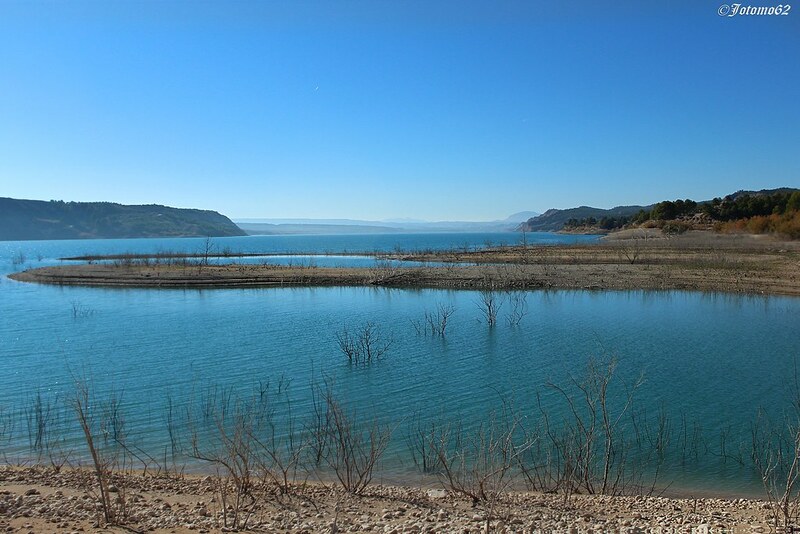 The reservoir is actually a lake, but, as it reminds of the sea, we’ve decided to insert this “beach” in the list of the best nudist beaches in Andalucia. Sand characterises the artificial beach, which was remodelled to fit the increasing demand for nudist beaches in the area. You can practice naturism around the 6 nudist urbanisations and a naturist hotel that are located in the northern part of the 3km-long Playa El Playazo. Its clear waters and the exceptionally clean seashore are the most noteworthy features of this beach. 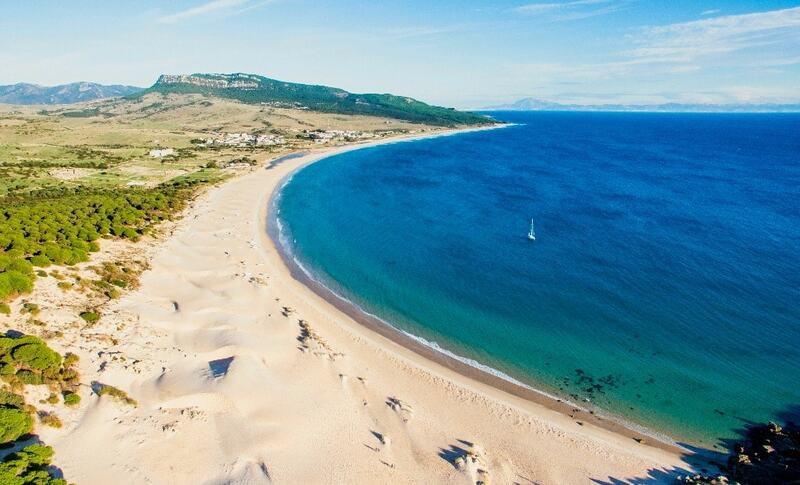 Here, you can enjoy footing, and this beach offers rescue service from June 15th to September 15th. 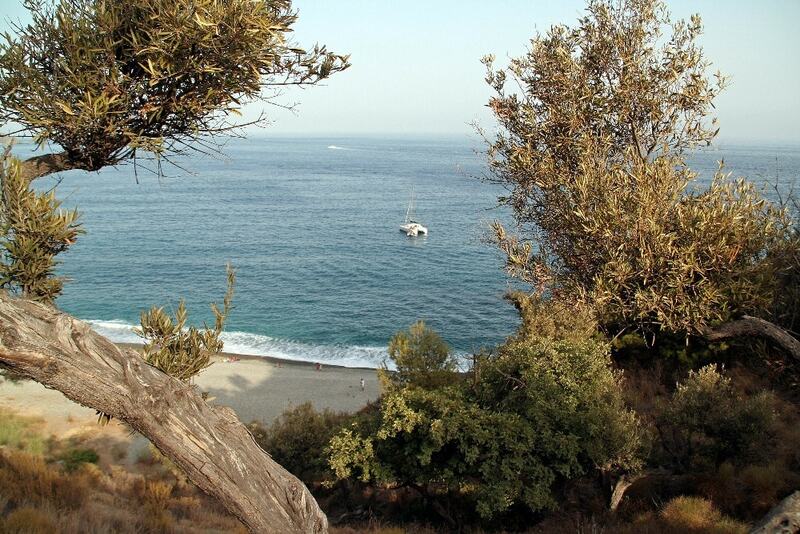 The small nudist coves between the cliffs and rocks that are part of the Natural Park Cabo de Gata – Níjar appeal those that look for a secluded place to practice naturism. 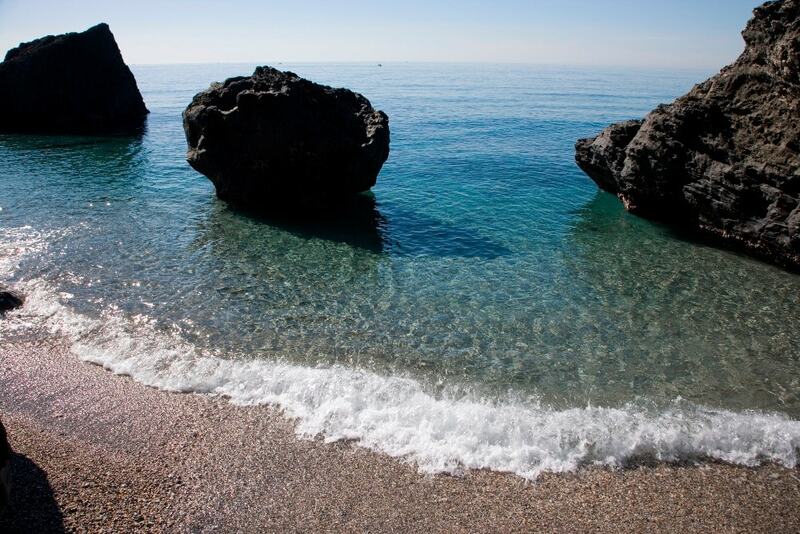 They are ones of the wildest and most secluded beaches in Andalucia, where you can sunbathe in your birthday suit. The beach of Barrancal and the beach of Genoveses also offer the possibility to do naturism and to be in harmony with the surrounding nature. The only thing you must remember is that these are semi-virgin beaches, for which we recommend you take some food and water with you to spend the day there. 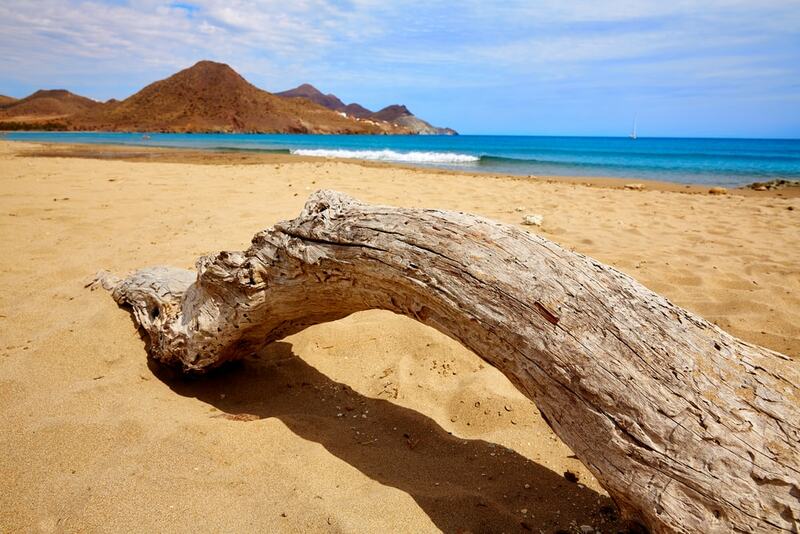 Another beach that is part of the Natural Park of Cabo de Gata deserves a special mention. It’s located near the town of Carboneras, but at the same time, you can only access it after a 15-minute walk. This is a gravelled beach, formed of small stones on which you will be able to move without any problems. Nudists and no-nudists share their summer here. 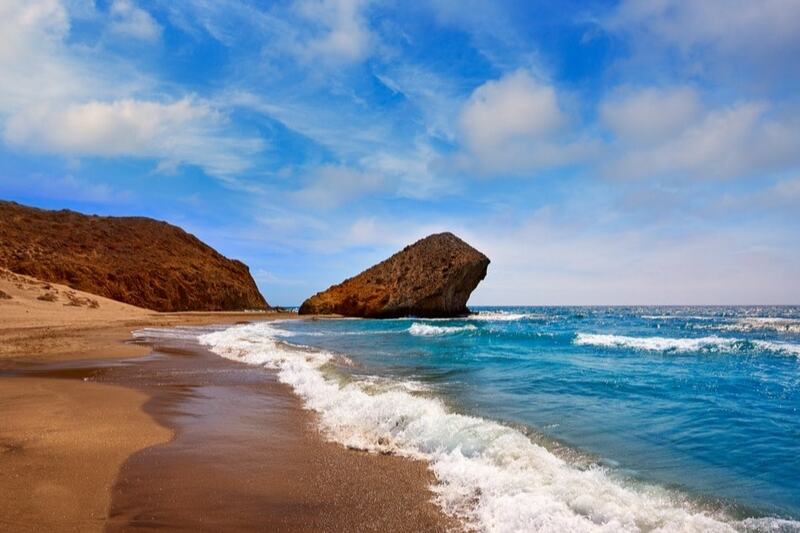 One of the most famous beaches in Cabo de Gata, this shore lies a few kilometres from the small town of San José, which you can reach thanks to a forest path. The surrounding area is so unique that many films have been shot here over the decades. This nudist centre in Rota is a referee in the province of Cadiz. Although its location might induce to think that this is a semi-urban beach, the truth is that this beach is provided with all the services you’ll need to spend a relaxing stay. The nudist section is perfectly marked, for which you won’t have any problems to enjoy the shore in your birthday suit. 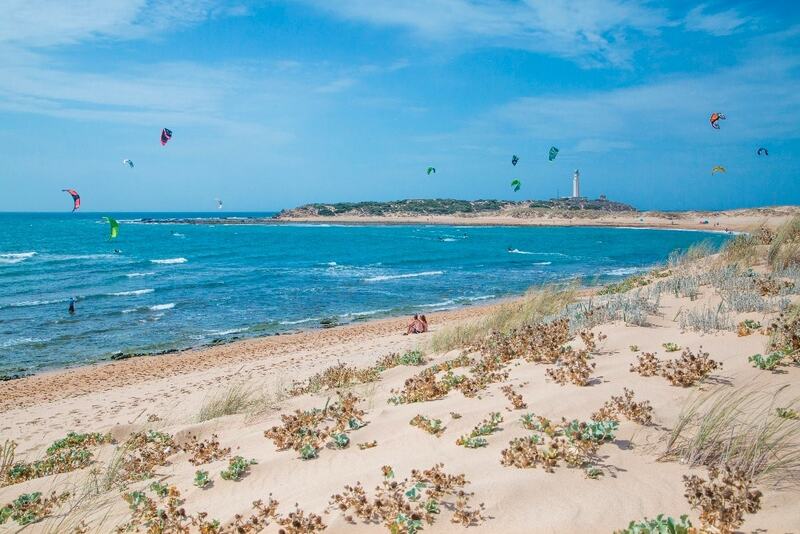 The dunes and pine forest of this beach make it one of the most visited and best-evaluated beaches in Cadiz province. One of the laterals of this beach is named El Chorrito, and it’s here where the practice of naturism is allowed. And in case you wish to have a mud bath, know that the nearby area lets you enjoy this special treat, too. Zahara de los Atunes is an idyllic town in the Gaditan coast, which relies on various beaches adapted to the practice of naturism. The beach of Arroyo del Cañuelo is one of them, surrounded by maritime pine forests, well-cared gold sand and inviting clear waters. This nudist beach stands out for its bohemian and romantic atmosphere. This is a virgin stretch surrounded by forests and maritime pines, which is a true luxury you can enjoy at sunset. If you walk a little further, you’ll reach the beach of Las Cortinas, with spectacular waterfalls. 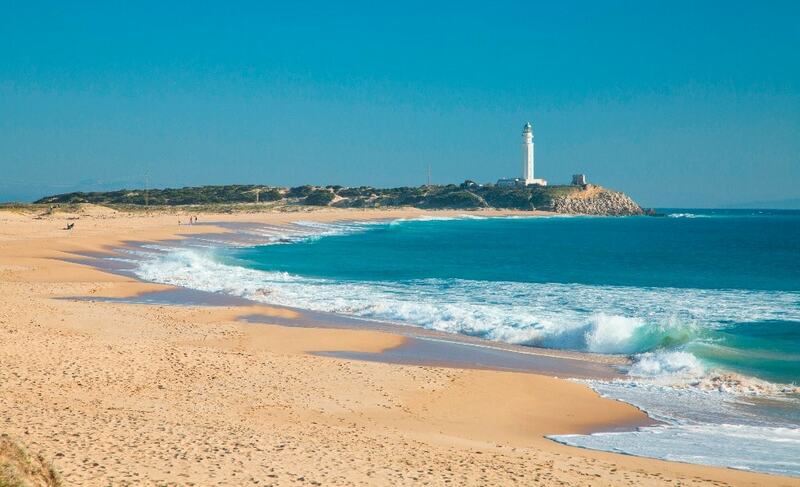 Both in the north and in the south of this town in Cadiz province, you’ll find nudist beaches, like Castinova. Here, you can enjoy the virgin atmosphere of the beach, as well as practice windsurf. Likewise, the beach of La Mangueta is a perfect beach for naturists, although it’s also open to those that prefer to keep their clothes on. This beach is south-orientated, for which the wind doesn’t blow with the same strengths as in other areas of the town. It relies on a cleaning service, surveillance service and a chiringuito, as well as an area specifically for the practice of naturism. Anyhow, this beach is also attended by no-nudists. 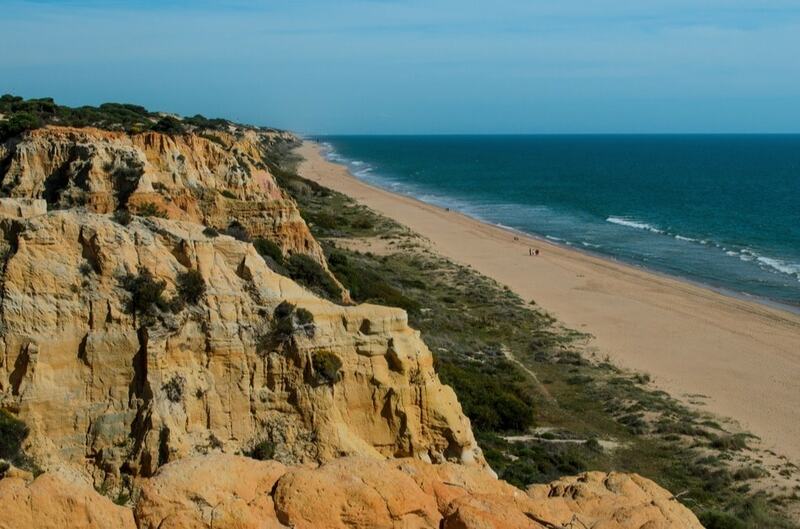 One of the longest beach in Huelva province, its partially-virgin 12 km are attended both by nudists and no-nudists. The 5km-long most-eastern area of the beach is entirely dedicated to the practice of naturism, an activity that represents a great part of the tourism that brings money to the province of Huelva. A curiosity about this beach is that it started emerging following the 1755 Earthquake of Lisbon. 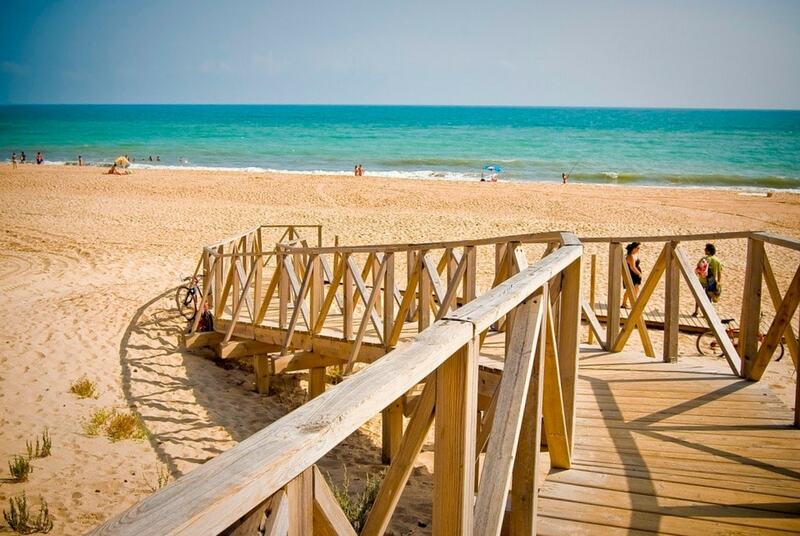 These two virgin beaches are located between Mazagon and Matalascañas, in the splendid National Park of Doñana. They are provided with one chiringuito that opens only in summer, for which they’re a real naturist paradise. Both beaches are dog-friendly and an ideal place to practice naturism (allowed on the left side of the shores). You can leave your car parked in the parking lot you will find before entering the beaches (€2). This almost-entirely virgin beach is surrounded by bushes, thus ensuring you can enjoy naturism while away from prying eyes. You can access the beach thanks to many wooden footpaths that connects the main road with the 2.3 km of the beach. If you want to discover all the nudist beaches in Andalucia, there’s nothing better than to stay in one of the fantastic holiday villas near the beach spread all over the region. Comforts are guaranteed in a unique environment! Do you know about any other nudist beach that’s worth mentioning? Tell us in the comments below!